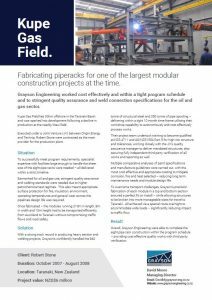 Grayson Engineering successfully fabricated one of the largest modular construction projects at the time – working cost effectively within a tight program schedule and to stringent quality assurance and weld connection specifications for the oil and gas sector. Working on the Kupe piperack in the Grayson Engineering workshop in Auckland. Kupe Gas Field lies 30km offshore in the Taranaki Basin and was sparked into development following a decline in production at the nearby Maui field. Executed under a Joint Venture (JV) between Origin Energy and Technip, Robert Stone were contracted as the main provider for the production plant. To successfully meet program requirements, specialist expertise with facilities large enough to handle the sheer size of the eight pipe racks were needed – all delivered within a strict timeline. Earmarked for oil and gas use, stringent quality assurance and welding standards were needed due to higher petrochemical test regimes. This also meant appropriate surface protection for fire, insulation, environment, operating temperatures and general wear across the pipelines design life was required. Once fabricated – the modules running 210m in length, 8m in width and 10m height had to be transported efficiently from Auckland to Taranaki without compromising traffic flows and road safety. 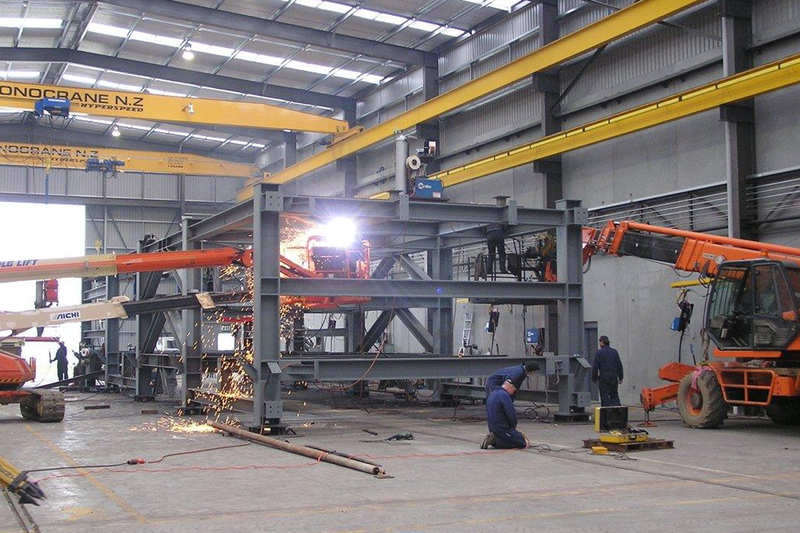 With a strong track record in producing heavy section and welding projects, Grayson’s confidently handled the 840 tonne of structural steel and 350 tonne of pipe spooling – delivering within a tight 10 month time frame utilising their workshop capability to autonomously and cost effectively process works. Their project team undertook training to become qualified at NZS 4711 and AS/NZS1554 Part 5 for high risk structure and tolerances, working closely with the JV’s quality assurance manager to deliver mandated structures, also securing fully independent third party verification of all works and reporting as well. Multiple comparative analyses of paint specifications and manufacture guidelines were carried out, with the most cost effective and appropriate coating to mitigate corrosion, fire and heat selected – reducing long term maintenance needs and module design life. To overcome transport challenges, Grayson’s precision fabrication of each module in a top and bottom section ensured a perfect fit on install – while allowing structures to be broken into more manageable sizes for travel to Taranaki. All achieved via a special route overnight to accommodate wide loads – significantly reducing impact to traffic flow. Overall, Grayson Engineering were able to complete the eight pipe rack construction within the program schedule – providing cost effective quality works with third party verification. If you’d like to find out more about this project, contact Grayson Engineering Managing Director David Moore. View or download this pdf today!